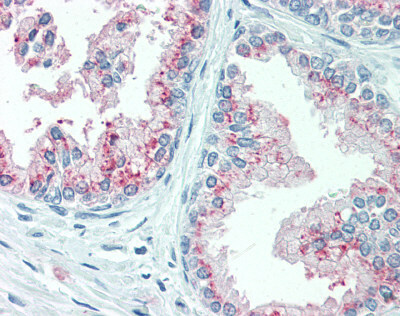 Immunohistochemistry analysis in formalin fixed and paraffin embedded human uterus tissue reacted with KIAA1324 / EIG121 Antibody (C-term) Cat.-No AP52282PU-N peroxidase conjugated to the secondary antibody and followed by DAB staining. Western blot analysis of KIAA1324 / EIG121 Antibody (C-term) Cat.-No AP52282PU-N in mouse spleen tissue lysates (35ug/lane). 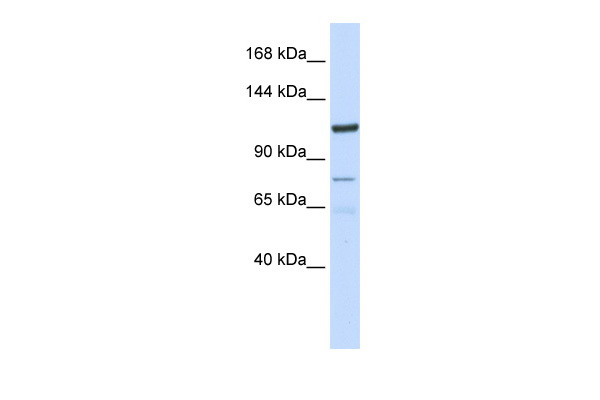 Western blot analysis of KIAA1324 / EIG121 Antibody (C-term) Cat.-No AP52282PU-N in MDA-MB435 cell line lysates (35ug/lane). 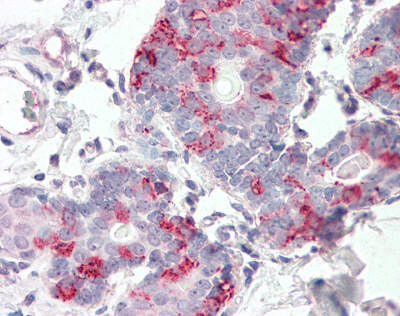 Anti-KIAA1324 antibody IHC of human adrenal. Immunohistochemistry of formalin-fixed, paraffin-embedded tissue after heat-induced antigen retrieval. 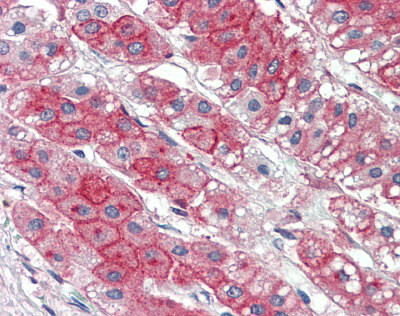 Anti-KIAA1324 antibody IHC of human liver. Immunohistochemistry of formalin-fixed, paraffin-embedded tissue after heat-induced antigen retrieval. 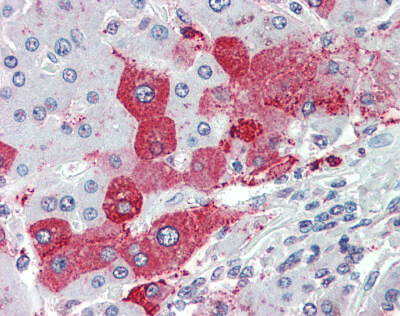 Anti-KIAA1324 antibody IHC of human breast. Immunohistochemistry of formalin-fixed, paraffin-embedded tissue after heat-induced antigen retrieval. 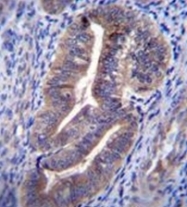 Anti-KIAA1324 antibody IHC of human prostate. Immunohistochemistry of formalin-fixed, paraffin-embedded tissue after heat-induced antigen retrieval. 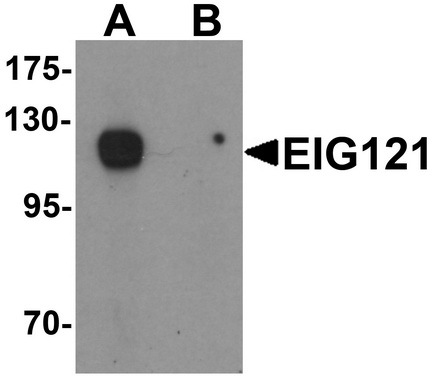 Western blot analysis of EIG121 in MCF7 cell lysate with EIG121 antibody at 1 ug/mL in (A) the absence and (B) the presence of blocking peptide. 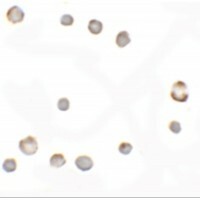 Immunocytochemistry of EIG121 in MCF7 cells with EIG121 antibody at 5 ug/mL. Immunofluorescence of EIG121 in MCF7 cells with EIG121 antibody at 20 ug/mL.